Build your next simulation and modeling cluster with an HPC innovator and system provider for award-winning discovery. Simulation and modeling applications, such as computer-aided engineering (CAE) and computational fluid dynamics (CFD), are designed to run on scalable, high-performance clusters. To support those applications at scale, modern high-performance computing (HPC) systems require multi-core processors, high-bandwidth fabrics, and broad input/output (I/O) capabilities. Because of the complexity and variety of technologies available on the market, assembling an HPC system can be time-consuming. Also, integration and configuration of selected components can impact the performance of the solution. The level of expertise required to properly configure the combined solution can intimidate even large organizations. An NT-HPC Simulation and Modeling Cluster from Nor-Tech will help companies leverage the benefits of HPC without the long investment in research and development. Nor-Tech has been a primary innovator in the HPC cluster space for more than a decade. The company’s elite staff of expert engineers, averaging more than 20 years of hands-on experience, is consistently conquering industry challenges that competitors long abandoned as insurmountable. The detection of the first gravitational wave that ultimately confirmed Einstein’s Theory of Relativity. The discovery of the origin of the universe through the study of cataclysmic astrophysical events involving exploding stars and black holes. The search for Alzheimer’s and PTSD cures. The design and development of a revolutionary combustion motor. Research into reducing aircraft noise and increasing airline safety. Research into the stabilization and formulation of biopharmaceuticals. The NT-HPC Simulation and Modeling Cluster provides a fast path for purchasing and deploying a cluster for advanced MPI workloads, plus, its configuration consists of a pre-validated selection of certain components designed to meet the demands of HPC applications and workflows. In addition, the performance of key system characteristics is verified for the Intel Select Solution for Simulation and Modeling at both the node and cluster level. Choosing an NT-HPC Simulation and Modeling Cluster takes the guesswork out of buying and deploying a cluster, and it puts the focus squarely where it needs to be—on using the cluster for discovery, higher productivity, and better performance. 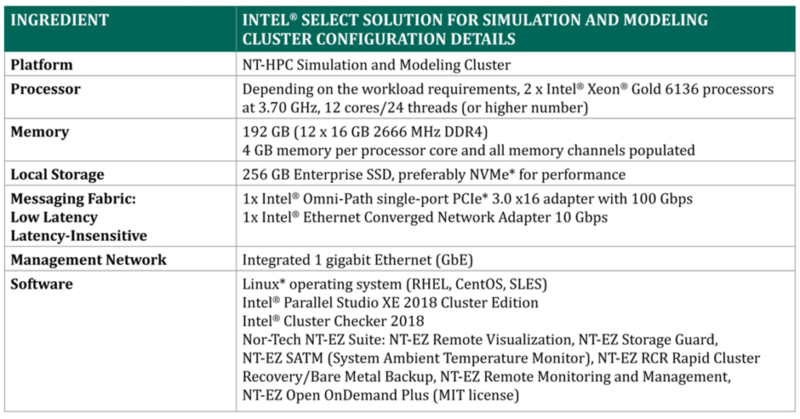 The NT-HPC Simulation and Modeling Cluster is comprised of several key hardware and software components: Intel® Xeon® Scalable processors, the Intel® Omni-Path Architecture (Intel® OPA) HPC fabric for latency-sensitive workloads, and other Intel® technologies that benefit HPC applications. Component choices deliver optimized performance for MPI-based simulation and modeling applications. Supportability is also addressed with the inclusion of Intel® Cluster Checker and Nor-Tech’s own branded NT-EZ Cluster Support solutions, which provide expert systems advice for administrators to use in keeping a cluster functioning. The Nor-Tech configuration uses the Intel® Xeon® Gold 6136 processor (or a higher number Intel Xeon processor). Intel Xeon Gold 6136 processors offer 12 cores to deliver exceptional performance for compute and data-intensive workloads. Optionally, Intel® Xeon® Platinum processors—with up to 28 cores—can be used to meet the most challenging compute needs. 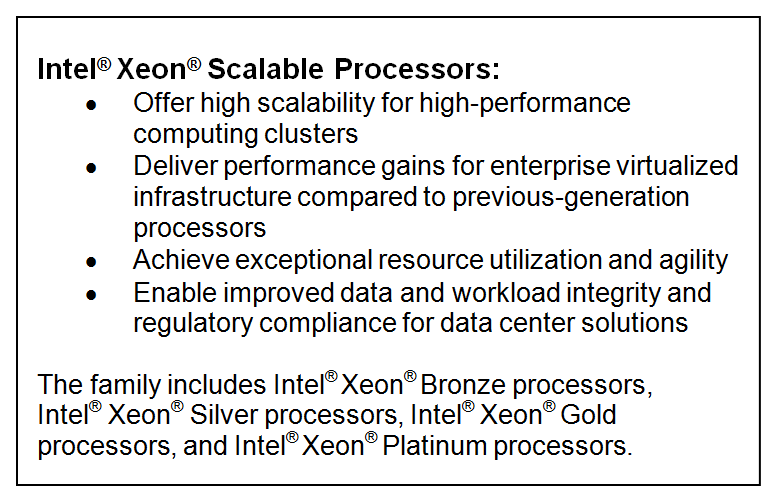 Intel Xeon Scalable processors feature significant enhancements that benefit HPC applications, including improvements in I/O, memory, fabric integration, and Intel® Advanced Vector Instructions 512 (Intel® AVX-512). The following table lists the basic hardware of the NT-HPC Simulation and Modeling Cluster. Hardware and software specifications are determined by the overall workload requirements and operating system. Intel AVX-512: Boosts performance for the most demanding computational workloads, with up to double the number of floating point operations per second (FLOPS) per clock cycle, compared to previous-generation Intel® processors. Intel Cluster Checker: Inspects more than 100 characteristics related to cluster health. Intel Cluster Checker examines the system at both the node and cluster level, making sure all components work together to deliver optimal performance. It assesses firmware, kernel, storage and network settings and conducts high-level tests of node and network performance using the Intel® MPI Library benchmarks, STREAM, the High-Performance LINPACK (HPL) benchmark, the High Performance Conjugate Gradients (HPCG) benchmark, and other benchmarks. Intel Cluster Checker can be extended with custom tests, and its functionality can be embedded into other software. Intel® Cluster Runtimes: Supplies key software runtime elements that are required on each cluster to ensure optimal performance paths for applications. Intel runtime performance libraries, including Intel® Math Kernel Library (Intel® MKL) and Intel MPI Library, deliver excellent performance optimized for clusters based on Intel® architecture. software tools, and libraries. Intel Xeon Scalable processors offer an unparalleled flexible framework, based on a common programming model, which supports code modernization initiatives across artificial intelligence (AI) frameworks. Built on Nor-Tech’s engineering expertise in HPC, the NT-EZ Suite is a family of cost-effective services that remove the classic obstacles to high performance computing. • NT-EZ Remote Visualization: Storage access too slow? With NT-EZ Remote Visualization, big data files don’t have to be transferred to the user’s location to be viewed for post processing. Only keyboard, mouse, and screen bits travel to the user location. • NT-EZ Storage Guard: This monitors cluster storage usage and alerts the user if available storage is reaching critically low levels. This keeps clusters stable and reliable. Without this feature, the client will run out of storage without warning causing the cluster job to crash. • NT-EZ SATM (System Ambient Temperature Monitor): This prevents cluster failure due to excessive heat. SATM emails alerts to the client warning that the server room ambient temperature is too high. When the ambient temperature climbs above a preset threshold the cluster is gracefully shutdown. • NT-EZ RCR Rapid Cluster Recovery/Bare Metal Backup: Run manual cluster backups or schedule backups seamlessly. This not only backs up the cluster data, but also backs up an image of both the data and the OS. In the event of a disaster the whole cluster software and applications environment can easily be recovered. This adds a level of reliability to our clusters that many competitors don’t provide. service allows us to find and fix small problems before they become disasters. This service is sold in blocks of hours ahead of when the service may be needed. • NT-EZ Open OnDemand© Plus3: This delivers a GUI through a browser instead of only a CLI. Use NT-EZ Open OnDemand Plus instead of cryptic file editors and Linux utilities, which are not user friendly. Nor-Tech adapted Open OnDemand Plus to work with Open HPC our most prevalent Open Source cluster management suite. Nor-Tech’s expertise and choice of hardware and software deliver optimized performance for MPI-based simulation and modeling applications in a single comprehensive, verified configuration. 1 Intel. “Performance Benchmarks and Configuration Details for Intel® Xeon® Scalable Processors.” intel.com/content/www/us/en/benchmarks/xeon-scalable-benchmark.html. Architecture pricing is based on estimated reseller pricing, which is based on projected Intel manufacturer’s suggested retail price (MSRP) pricing at time of launch. 3 The MIT License (MIT): Copyright © 2016 Ohio Supercomputer Center. The software is provided “as is” without warranty of any kind, express or implied, including but not limited to the warranties of merchantability, fitness for a particular purpose and non-infringement, in no event shall the authors or copyright holders be liable for any claim, damages or other liability, whether in an action of contract, tort or otherwise, arising from, out of or in connection with the software or the use or other dealings in the software. Tests document performance of components on a particular test, in specific systems. Differences in hardware, software, or configuration will affect actual performance. Consult other sources of information to evaluate performance as you consider your purchase. For more complete information about performance and benchmark results, visit intel.com/benchmarks. For more complete information about performance and benchmark results, visit intel.com/benchmarks. Intel, the Intel logo, Intel Xeon Phi, and Xeon are trademarks of Intel Corporation in the U.S. and/or other countries.